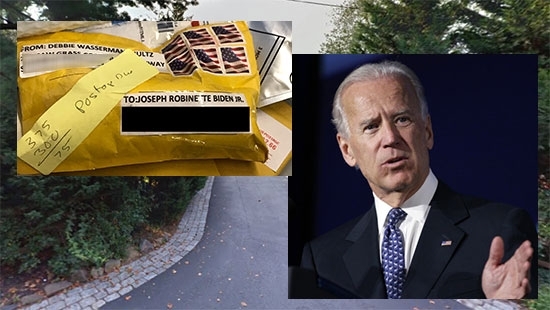 Two suspicious packages addressed to former Vice President Joe Biden were discovered at postal facilities in Delaware on Thursday morning, 10/25. These packages were similar to the ones sent to other political figures yesterday in various parts of the country including former President Barack Obama and Hillary Clinton. Federal, State, and Local authorities responded to the United States Postal Facility located at 147 Quigley Boulevard in New Castle, DE, around 6 a.m. after one package was found. Then just before 8 a.m. at a postal facility in the 1500 block of Lancaster Avenue in Wilmington, workers discovered another package. Both were addressed to Joe Biden. They were packaged like the others; bubble wrap lined manila envelopes, 6 US flag stamps, computer printed addresses, and a return address to Rep. Debbie Wasserman Schultz. All of the packages contained suspected pipe bombs. None of the bombs have gone off and no one has been hurt. A device was also sent to actor Robert De Niro at an address in Tribeca, Manhattan, and discovered early Thursday morning. So far, suspicious packages containing suspected bomb devices have been found addressed to George Soros, the Obamas, the Clintons, former CIA Director John Brennan (CNN building), Rep. Maxine Waters, former Attorney General Eric Holder, former Vice President Joe Biden, and Robert De Niro. Philadelphia Police are investigating after a shooting victim was found lying in the street in just his underwear on Wednesday night, 10/24. It happened just after 9 p.m. on the 5500 block of Willows Avenue in the Kingsessing section. Police on patrol hear gunfire and responded to the scene. The victim was found without his clothes on and suffering from multiple gunshot wounds to his chest and torso. He was taken to Penn Presbyterian Hospital in critical condition. "What's unusual about this particular shooting is when police found the victim laying on the sidewalk, he was wearing only his underwear. His clothing was next to him - a jacket, jeans and sneakers - so it appears the shooter or shooters made this individual strip either just before or after they shot him," said Philadelphia Police Chief Inspector Scott Small. No arrests have been made. The motive appears to be robbery. Police in Bucks County are searching for a trio of bike riding bandits that used a motorized scooter to steal beef jerky and alcohol from a supermarket on Tuesday night, 10/23. It happened at the Feasterville Acme and was caught on surveillance tape. Lower Southampton Police say that the three men arrived at the store on bicycles. Once inside they took a mobility scooter usually reserved for those with disabilities to help in the commission of the crime. The men proceeded to place alcoholic beverages and beef jerky inside backpacks and their pants. They were confronted by store employees, but they managed to leave the store and flee on their bikes. If you recognize these men (see photo below) or have any information call 215.357.1235.